Hartlepool United are limping their way to National League safety. Without any major twists or turns between now and the end of the season - Pools have just four fifth-tier games left - they’ll be in this division again come August. But it’s been far from pretty, as we all know. 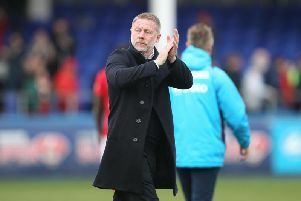 And at the dawn of a new era there’s little cause for optimism by what has been produced on the park in the club’s National League debut season. That despite a revival under Matthew Bates, which is also falling apart at the seams. On a day where Pools were desperate to toast Raj Singh’s takeover with three points, the were yet again hit with a late sucker punch. On the selection front, Bates made just the one change from the side beaten by Guiseley on Easter Monday. Having flattered to deceive against the National League’s basement boys earlier in the week, Pools carried on where they left off in this encounter. Just six minutes before half-time Fiacre Kelleher missed a gilt-edged chance to break the deadlock. A dangerous cross from Pools’ right found its way though to Kelleher who turned over the bar from just two yards. It was a real let off for the hosts. Anything Pools can do, so can the Moors. At the other end substitute Omari Sterling-James, just a few minutes after coming on, clipped Scott Loach’s bar with a similarly ambitious effort. Having worked themselves into a position to secure safety this week, Pools are no closer than they were seven days ago. And things might get a little bit nervy should Barrow manage to win one or even both of their games in hand, given that Pools take on second-placed Sutton away from home on Saturday. One more win, three points will do it, but keep playing like the weekend and it’s difficult to see where it’ll come from.